Children are easily led into the Kingdom of God. They are innocent and trusting. ‘Little children were brought to Jesus so He could lay His hands on them and pray but the disciples rebuked them. 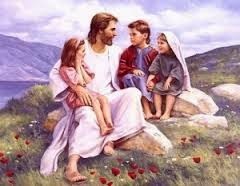 Jesus said, "Allow the little children and do not forbid them to come to Me, for the Kingdom of Heaven belongs to children like these." He laid His hands on them and prayed’ (Matthew 19:13 to 15).